Small child wearing a beautiful dress and a locket necklace. 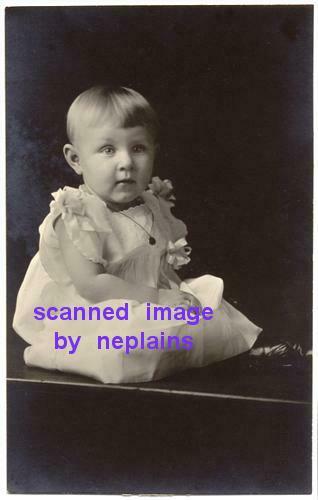 "Harriet Lillian Bauersfeld age 17 months" is penciled on back. Location is unknown; photo was found with other items from southeast Nebraska and northeast Kansas. Slight corner and edge wear. Just a few small, very light scuffs or smudges near edges.